We have no more Rivendell frames! Due to the rising value of the Japanese Yen vs the US Dollar, Rivendell has made some changes to their distribution, and I have decided that I can no longer sell their frames. Please don't misunderstand. I love Rivendell frames! My good feelings towards Grant and everyone else at Rivendell are as strong as ever. They make great frames. I wish I could continue to sell them. But it simply doesn't make good business sense for me. Don't worry. If you would like a Rambouillet, Hilsen or any other Rivendell frame built into a bike my way, you can have the frame shipped to us for assembly. I was building up Riv bikes long before I became one of their dealers. 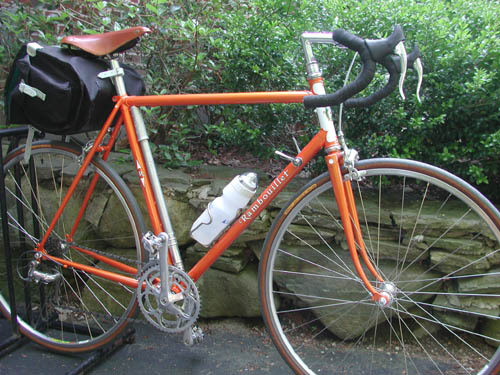 Rivendell offers complete bikes as well, but generally with different components than I use. So you can have them build it, me build it with my wheels, or just buy the frame and build it up yourself. Here are some photos of a typical A Homer Hilsen build. Here's the front end of the A Homer Hilsen fitted with Berthoud 50mm stainless steel fenders. The tires are Schwalbe Marathon Racer, 700x35. As you can see there's plenty of clearance between the tires and fenders. The brake calipers are Tektro long reach sidepulls. The headlight is a Busch & Müller Lumotec IQ CYO R Senso Plus, using an extremely bright LED, powered by a Schmidt SON28 6 volt hub dynamo. The rims are Velocity Synergy. The bar end shifters are 9 speed Dura Ace, the rear is indexed for nine speeds and the front is a nice retro-friction design that won't slip. The stock ShimanoUltegra headset has been replaced by a Chris King. In back we've mounted a Tubus Cosmo stainless steel rack. 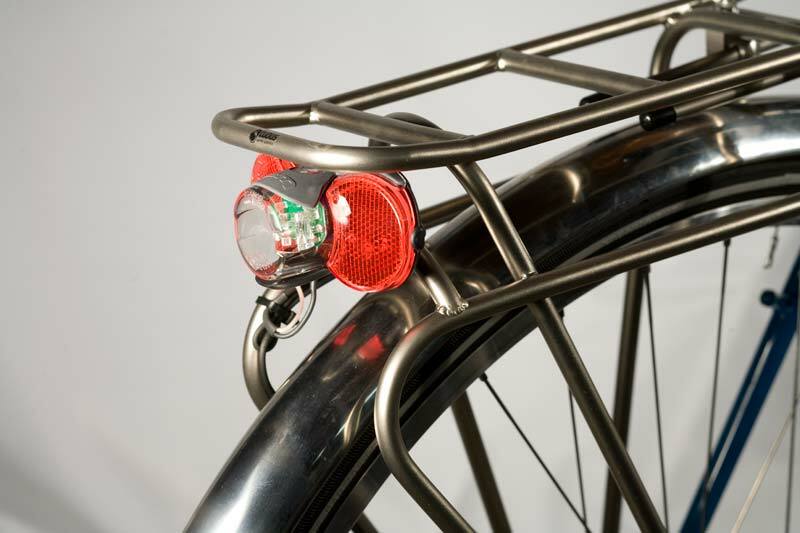 The rack has proper mounting points for European taillights like this Busch & Müller DToplight XS Plus, which is wired to the headlight, and then to the hub dynamo. The rear hub is a White Industries MI5. The MI5 is a nice match with the Schmidt hub dynamo, both cosmetically, and in quality. If cost and weight is no object, we also have Phil Wood hubs, which also look very nice with the Schmidt hub. The top of the rack extends out over the taillight. The red LED is in the clear center section of the light, and there are red reflectors on each side. 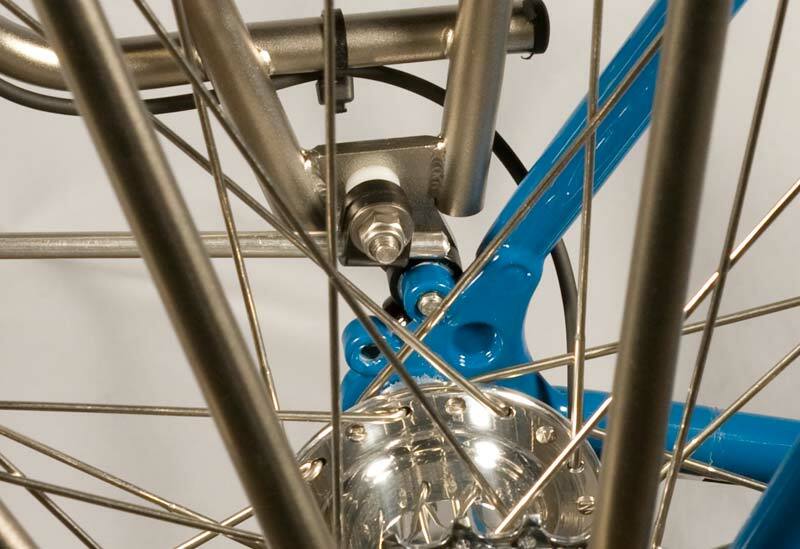 The Hilsen has two eyelets on each rear dropout. However, they are fairly close together, and the Berthoud fenders would be difficult to attach to the lower eyelets with a rack attached. Fortunately, the Tubus rack has a place to mount the fender struts. Here's the left dropout. You can see that the rack is attached to the upper eyelet, and then the fender strut is bolted to the inside of the rack. We've used a white nylon spacer, you'll find an assortment on my hardware page, and then used the standard Berthoud hardware to attach the fender strut to the rack. When we install any bottom bracket, we always machine the bottom bracket threads. Bottom bracket shells rarely have the threading on each side on a common axis. I use the Campagnolo bottom bracket threading taps to bring the threads onto a common axis. Some bearing sets require that the cups press against the end of the bottom bracket shell. But others, like the Phil Wood shown here, don't contact the ends of the shell. The Campagnolo tool can also face the ends of the shell, so that the ends are perpendicular to the crank axis. But since the Phil Wood doesn't touch the ends of the shell, that would leave bare steel exposed to rust, so we left the end faces of the shell alone on this bike, which looks much better. It's highly unlikely that anyone would ever replace the Phil Wood BB, but if necessary, the shell can always be faced later. Also notice the fender mounting. The Hilsen comes with a kickstand plate, a really nice touch for a touring bike. The kickstand plate also has a tab for attaching the forward end of the fender. If this bike had larger tires, we would have placed the fender right up against the tab for added clearance. But with 35mm tires that wouldn't look as nice. So we use nylon spacers to position the fender the correct distance from the tire. We have these spacers in many sizes. We use stainless steel nuts and bolts, no aluminum or titanium. I'll keep this page up, not just until I've sold the last Rambouillets and A Homer Hilsens I have in stock, but for as long as Riv has them. I'm happy to promote them, and to continue building up bikes with these terrific frames. If you need a size I no longer have, I recommend contacting them directly, or checking around with other dealers who may still have some in stock. These two frames are so similar, I've decided to keep them on the same page, at least until I think of a reason not to. 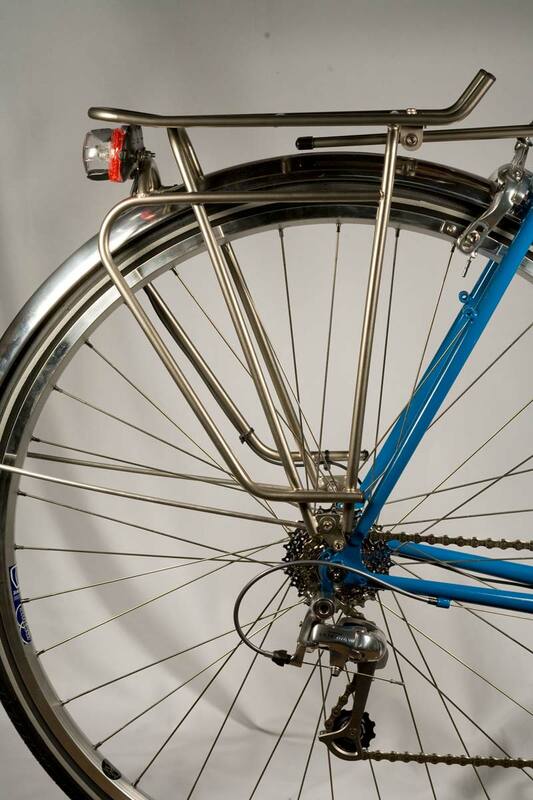 If you start from the Rambouillet, the Hilsen has longer chainstays, by one centimeter. It also requires longer caliper brakes, because it has clearance for larger tires. 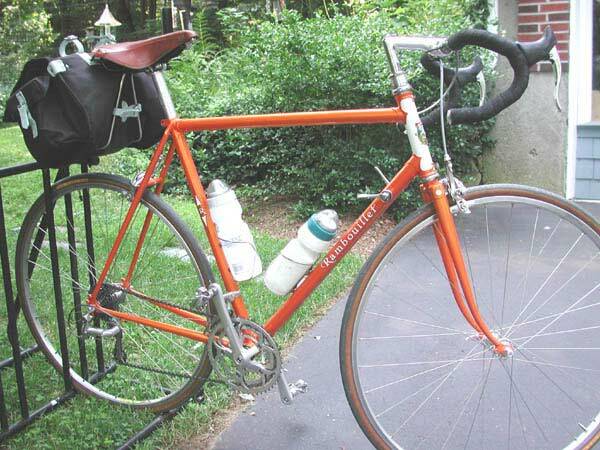 Essentially the Rambouillet is great for fast day riding with the racer wannabees, brevets and credit card touring. The Hilsen is more into the loaded touring category. 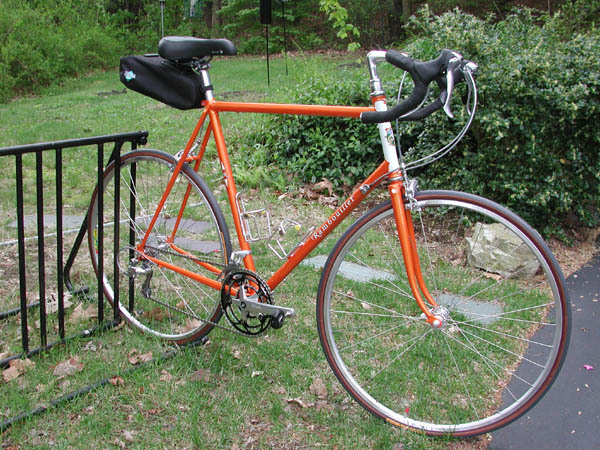 When you put full panniers on it, the handling will be a bit more stable than if you load down the Rambouillet. And with fat tires on the Hilsen, dirt roads will be more comfortable to ride on all day. So for now the text below is what it has been ever since I started selling the Rambouillet frames several years ago. Virtually everything written here applies to the Hilsen, with the caveats above. 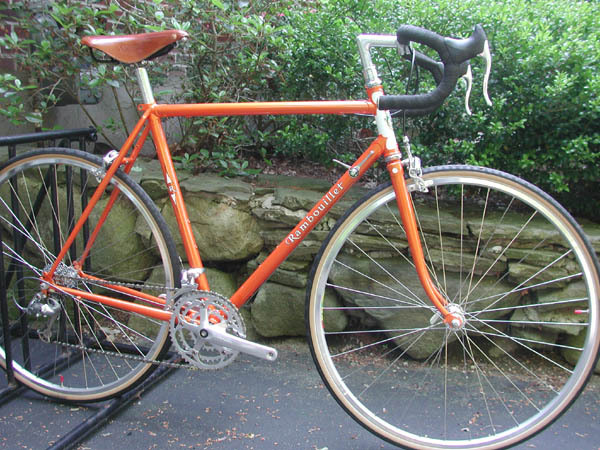 Of course, we have no more Rivendell FframesAs soon as I have time, I'll list maximum tire sizes I'm happy recommending, with and without fenders. My recommendations have been a bit more conservative that Rivendell's recommendations in the past. I usually recommend a smaller maximum tire size with fenders than Riv does. It is somewhat personal preference; essentially how risk averse you are. The smaller the gap between the tire and the fender, the easier it is for something to get caught in there. I like lots of space; some people are happy with less. My recommendations are only that; recommendations. You're the one riding the bike, and accepting the risks that come with our favorite outdoor activity. What's a Rambouillet? There are two ways to think of it. It's either a racing frame with a bit longer wheelbase, because the chainstays are longer; and provides a higher handlebar position, because the top tube slopes upwards a bit, and the headtube is extended; and there's lots of tire and fender clearance. Or it's a touring bike with a wheelbase that's too short for carrying heavy loads, so it's perfect for weekend tours where you're staying at B&Bs or hotels and don't need a tent, sleeping bag and lots of clothes. In short, it's a bike for someone who wants a really comfortable and stable ride. There is clearance for pretty large tires, which make the ride smoother. Larger tires aren't necessarily slower, if they're high quality. And they make a huge difference if you're doing long distances in a day, because they soak up road shock. The seat tube is set back more, to take weight off of your hands, and help you enjoy the scenery. The wheels have Dura Ace hubs, Mavic MA-3 silver rims, Continental Ultra 3000 700x28 tires. Drive train is Ultegra Triple, with 9 speed downtube shifters, 13-25 Ultegra cassette, Sachs chain, TA Zephyr 175mm crankset with 50-40-26 rings, TA Axix Light bottom bracket, TA Auto-Extractors, Shimano 747 SPD pedals. Shimano R600 long reach calipers, Dia Compe BRS500 brake levers, 3ttt handlebar and stem, Cinelli cork tape. Salsa seatpost and Brooks B17 Champion Special. The saddlebag is a Carradice Nelson Longflap. A Homer Hilsen note: While the Rambouillet spaces the rear at 132.5mm, to take either 130mm or 135mm hubs, the Hilsen is spaced at 135mm. So road hubs like Dura Ace aren't suitable for the Hilsen. You'll notice that all of the bikes pictured here have triple cranksets. You can have your Rambouillet with a double if you prefer. I just haven't gotten around to photographing one with a double crankset. 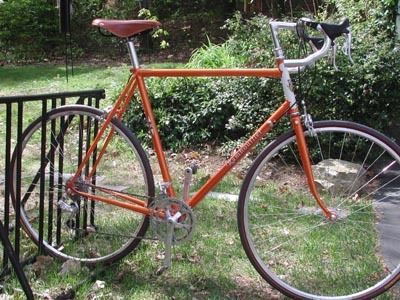 This is also my Rambouillet, with a few miles on it. I've added a Bagman support for the Carradice Nelson Longflap. I decided I wanted the bag held in a more upright position. It's much easier loading groceries now. I've also retired the Silca pump in favor of a Topeak that fits inside the bag. And the Nitto "R" cages are really cute. This bike is fitted out with a Shimano drive train, mostly Ultegra 9 speed, but with a TA Alize triple crankset, black chainrings, Dura Ace hubs and Mavic MA-3 rims. The saddle bag is by Ortlieb. Terry Liberator Men's saddle on a Salsa post. Speedplay Frog pedals. This bike is similar to my own, using Dura Ace downtube 9 speed shifters and Ultegra Triple derailleurs. The hubs are Ultegra. Rolly Poly tires from Rivendell. Shimano R600 brake levers and calipers. These are the long reach version of the Ultegra dual pivot sidepulls. 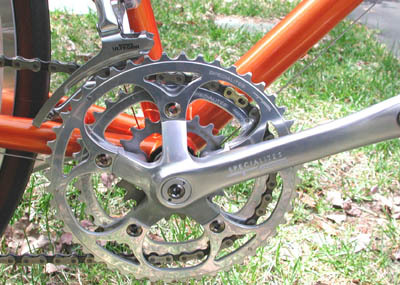 The crank is a TA Alize on a TA Axix Light bottom bracket. Nitto handlebar and stem, wrapped with Cinelli cork tape. To use Ergo shifters with Shimano rear hubs and cassettes, I recommend the ShiftMate adapter. A Homer Hilsen note: Since Campy only makes 130mm rear hubs, you might think that Campy drive trains won't work with the Hilsen. But! I have a few tricks up my sleeves if you just have to have Ergo on board. This customer wanted to wrap the handlebars himself. I haven't been recommending Campagnolo drive trains for many years due to the high dish of the rear wheels. But Velocity has recently made their terrific Aerohead rim available in an off center version, which dramatically reduces the dish, making it possible to build very strong wheels with Campagnolo cassette hubs. 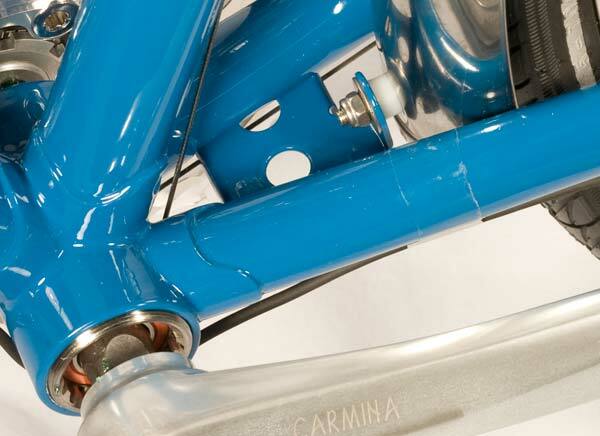 I can now wholeheartedly recommend Campagnolo components with Rambouillet frames. Everything will work except the brake calipers. Campagnolo doesn't yet make a long reach brake caliper. Just use the very fine Shimano Ultegra long reach calipers instead. Everything is compatible, and it looks right. These gorgeous Zephyr cranks haven't been made in many years. 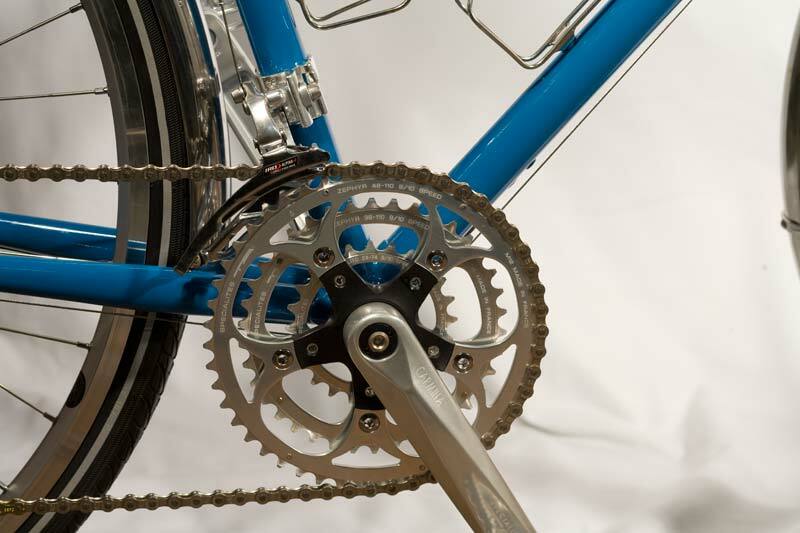 On frames with 130mm rear axle spacing, TA cranks can usually be installed with neutral chainline. That means the middle ring on a triple is in the same geometric plane as the middle cog on a 9 speed cassette. But the Rambouillet chainstays are slightly wider spaced than on most frames. So the crankset has to be placed a couple of millimeters to the outside. This is done with a longer bottom bracket. Rather than using a 122mm axle with the Zephyr crank, a 125mm axle is used. The Alize goes from a 113mm axle to a 116 when installed on the Rambouillet. The difference is tiny, not enough to adversely affect the drive train. In fact, it puts the TA chainrings in the same position as the Shimano triple cranks, which all put the chainrings slightly off to the right. Shimano does it because they want to use one BB axle length for all frames. Frames with oversized seat tubes need long BB axles to place the chainrings to the outside. 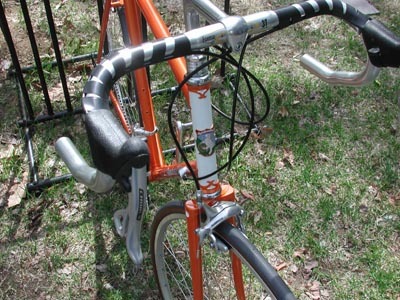 This is because the large seat tube places the front derailleur further to the right. 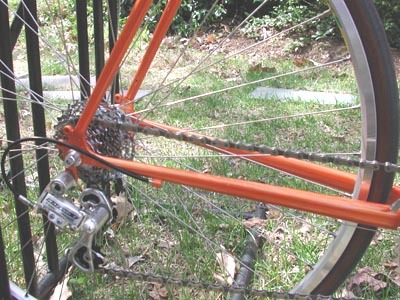 If the chainrings are in the neutral chainline position, the front derailleur can't move far enough inboard to shift the chain onto the inner chainring. The derailleur bumps into the frame! The chainstays of the Rambouillet frame are spaced a bit wider than on most frames to make lots of room for wide tires and fenders. If the cranks are installed with perfectly neutral chainline and a standard 130mm road hub, the inner ring will hit the right chainstay socket of the bottom bracket shell. Changing the axle to one a bit longer eliminates the problem. You can have neutral chainline on a Rambouillet if you use a 135mm rear axle hub, such as a Shimano XT, XTR or a Phil Wood. 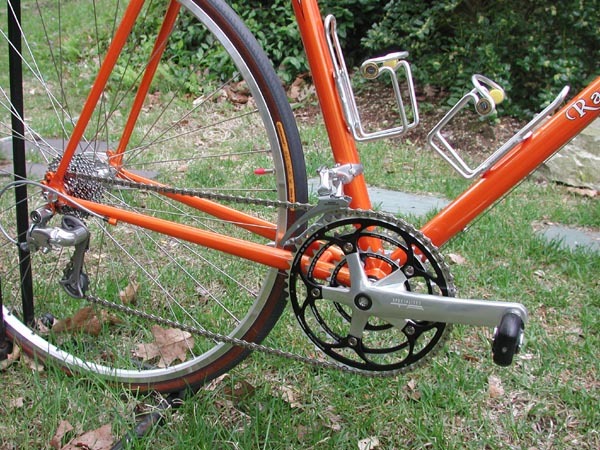 That moves the cassette slightly to the right and lines it up with the cranks. I chose to use a 130mm rear hub on mine, since the amount that the chainline is off is so small. Some times it's fun to split hairs. TA Alize cranks with Ultegra Triple derailleurs. Very quick and smooth shifting, and you can get the chainring sizes you want. Other headsets are available, including King sealed bearing headsets and Campagnolo. See the Rivendell website for the A Homer Hilsen sizing chart. 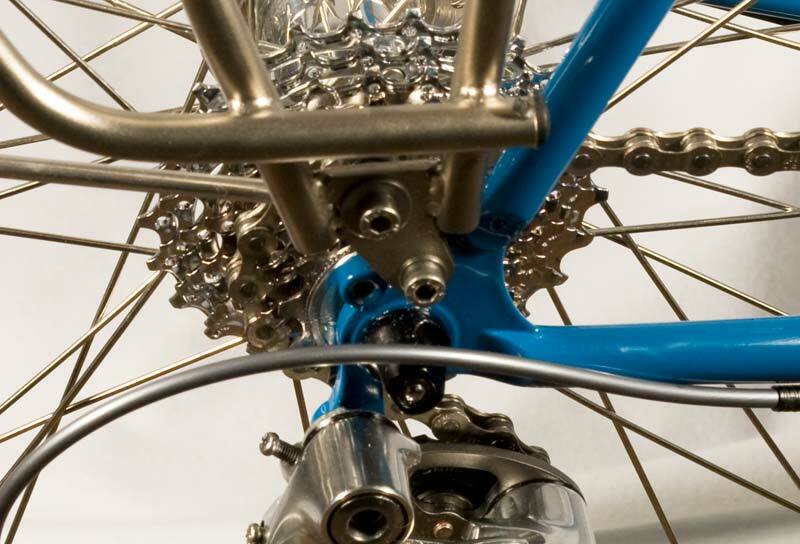 Rambouillet rear axle spacing is 132.5mm, splitting the difference between road and mountain hubs. The frame will easily accept either 130mm or 135mm rear hubs. A 135mm rear hub with nine speed cassette gives slightly better chainline with a triple crankset, but the difference is almost academic. A Homer Hilsen is 135mm. Many riders prefer a Chris King headset and I can swap out the Shimano headset if you like. Many component options including bar end shifters, downtube shifters, Dura Ace and Ultegra stems, Nitto stems, Specialites TA Alize, Zephyr Light double or Carmina cranksets, TA or Phil Wood bottom brackets, Chris King or Campagnolo Record OR headset, 9 or 10 speed Dura Ace components, 9 or 10 speed Campagnolo components, and many saddlebags and lighting systems. With TA cranksets, you have many more crank lengths to choose from. 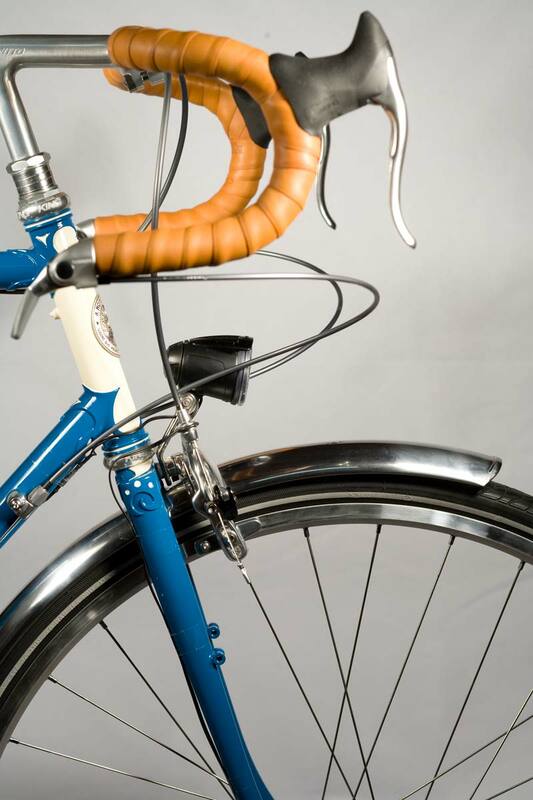 Carbon fiber fenders from Gilles BERTHOUD are perfect for the Rambouillet. I have many wider fenders as well in both stainless steel, and aluminum/plastic sandwich.